Cut potatoes into approx. 1 inch cubes. Using a dish towel or a few paper towels, squeeze as much of the liquid from the sauerkraut as possible. Prepare a baking sheet by spraying lightly with non-stick spray. 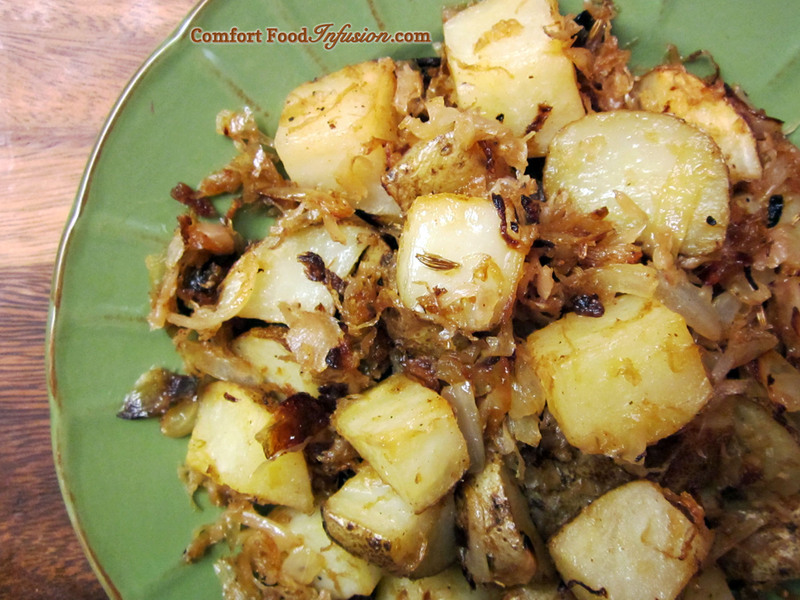 Spread in a single layer on the sheet, the potatoes, sauerkraut and onion. Drizzle oil over all. Sprinkle seasonings over all. Using your hands, toss the vegetables to coat with oil and seasonings. Bake in 425° F oven for about 20-30 minutes, stirring every 8 minutes or so to evenly brown.